Rocket Matter Knowledge Base ReportsHow do I use the 'Billable Activity by User(s)' report? This report shows what Rocket Matter Users billed during a specific time period for all matters. The report can be run for an individual user, or for multiple users. You can choose to display billable items, non-billable items, no charge items, and expenses. 1. Click on the Billable Activity by User(s) report in the 'Reports' section. 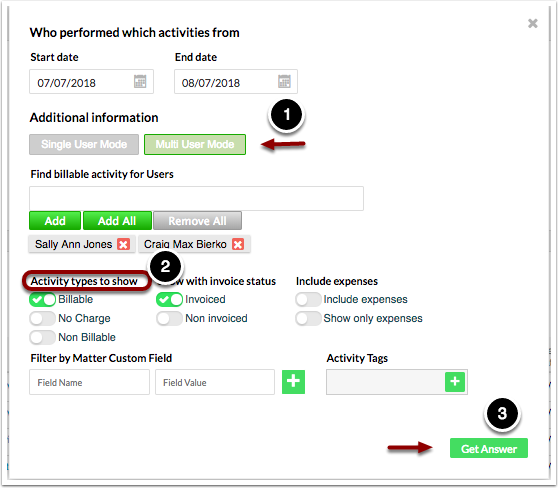 * The 'Billable Activity by User(s)' report can also be accessed from My Dashboard, by clicking on the 'User Billing' widget. 2. The 'Report Summary' will pull a monthly summary of all billable activity for all users. 3. To filter your results, select 'Edit Filters'. 4. Choose to filter by single or multiple users. For a more granular result, add additional filtering options like 'Activity type', 'invoice status' and 'expenses'. Click 'Get Answer' to apply your filers. 5. You may export your results for reporting or record keeping purposes. Prev: How do I migrate from QuickBooks Desktop to QuickBooks Online?